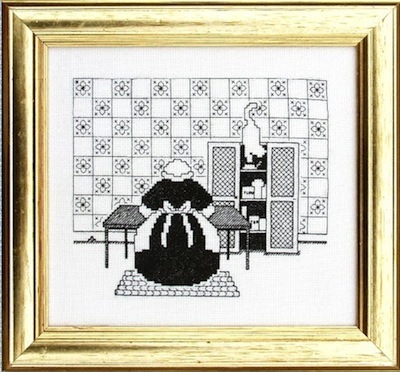 A very popular series of blackwork designs that also feature silhouetted cross stitch characters. Mischief the cat gets into all sorts of trouble both upstairs where mistress is doing her embroidery, and downstairs in cook's domain. 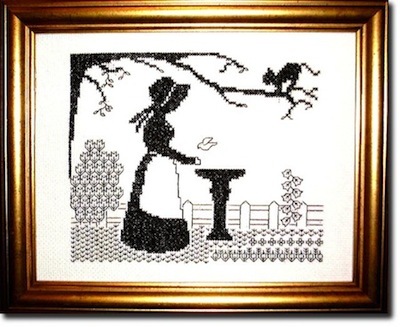 Simple to stitch, using just a few blackwork fill patterns and areas of cross stitch in just one color these projects won't take you long to complete. If you love cats don't miss this pretty cat needle case worked in a combination of blackwork and Assisi work. Our stitcher is engrossed and has not noticed the mouse by her feet. But Mischief has, and is about to pounce! Just one blackwork pattern used here for the wallpaper. 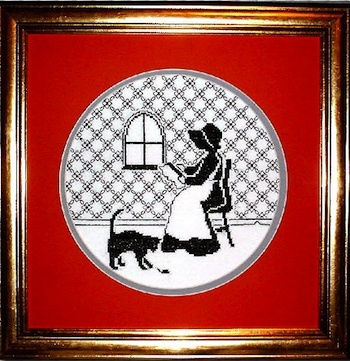 The rest of the picture is created with black cross stitch and the white fabric. Quick to stitch, but so effective. In this design Mischief has gone downstairs to pester Cook in the kitchen, who will freak out if she notices the mouse in the pantry cupboard! Will Mischief catch it, or will it make it back to its mouse hole in safety? Blackwork patterns are used here for the kitchen tiles on the wall, the cupboard doors, and the rag rug underfoot. In the last of this series of blackwork designs, Mischief has her eye on the bird, that mistress is feeding. Will he leap? More blackwork patterns are used here - for the grass, bush, flowers and plants in the garden. It is almost like a little sampler.